At this week’s voluntary tutorial on Economics 2B run by GURWES, some points came up which may need further clarification. It was asserted that firms generally (and particularly firms in manufacturing) produce with constant marginal/unit cost. This is in contrast with neoclassical microeconomic theory, which typically holds that firms will produce at rising MC. The first thing to note is that this question is of highest importance when discussing perfect competition. 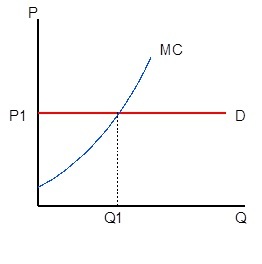 In the first tutorial, the point was made that an independent supply curve can only be derived for perfect competition (an independent supply curve traces out a unique relationship between quantity and price, i.e. each quantity is only produced at one specific price and vice-versa). All mainstream micro textbooks make this point, and usually have a diagram to show why a supply curve which is independent from the demand curve cannot be derived for a monopoly, for instance (see e.g. Pindyck & Rubinfeld, 2012, p. 366 (still the 2A textbook?)). So, keep in mind that whenever you are shown a diagram (e.g. to analyse the welfare impact of a sales tax) where supply and demand are depicted as independent, it is implicitly assumed that the investigated industry is perfectly competitive, even if this is not mentioned explicitly. I know, in the first tutorial we showed how even under perfect competition, an independent supply curve cannot be derived, but let’s accept the neoclassical reasoning for the moment, i.e. assume that a perfectly competitive firm is facing a horizontal demand curve at the prevailing market price. From the presentation in most micro textbooks, you could get the impression that at least 90% of the economy was perfectly competitive, by the relative weight given to the examination and application of that theory. A prime example is Mankiw (2012) who, in his treatment of income distribution, thinks it’s okay to model the entire economy as perfectly competitive. This is not the case (quite apart from the fact that the theory is unsound in the first place). Studies like Blinder’s are also a good point of departure for discussing the Post Keynesian/Kaleckian theory of the firm. There are other studies also cited in Keen (2011, Ch. 5) showing that constant or falling marginal cost is appropriate to describe the vast majority of firms’ cost-conditions in industrialised countries. Then there is the data on excess capacity, also cited in that chapter as well as in Lavoie (2006), which we mentioned in the tutorial. Observing this evidence, which are the most appropriate premises on which to construct a theory of production? The Post Keynesian theory of the firm, as presented to you in lectures and this week’s tutorial, would suggest itself since Leontief production functions result in constant or, under economies of scale, falling unit direct cost. In this sense, it is in accordance with the real world. Is this a perfect description of reality? Probably not, but I would argue that it is a far more valid generalisation than neoclassical production functions given the empirical data. Note that the “law” of diminishing returns has its origins in classical political economy. David Ricardo used it to derive a theory of aggregate rent on land. So it was originally conceived as a concept applying at the macro-level, connected to the distribution of income. Neoclassical economists picked up on the concept and applied it to the micro-level theory of production. Sraffa’s broad arrow: If an industry is broadly defined (say, the agricultural sector), it is valid to treat one input as fixed. The industry utilises a large share (or, in extreme cases, all) of it and it will be costly and time-consuming to obtain additional doses of it. However, such a broadly defined industry can no longer be treated as a price-taker in input markets. If agriculture attempts to increase its output by employing more labour, the price of labour (the wage rate) will rise. This affects the distribution of income, and hence demand for the output of this broadly defined industry. Demand and supply are not independent, i.e. it is not possible to derive an independent supply curve. “Thus while diminishing returns do exist when industries are broadly defined, no industry can be considered in isolation from all others [which is what neoclassical theory of production does], as supply and demand curve analysis requires” (Keen, 2011, p. 111). Sraffa’s narrow arrow: If an industry is narrowly defined, on the other hand, Sraffa argues that the assumption that some input is fixed is not reasonable. Sraffa argues that, if need be, such a narrowly defined industry will be able to draw marginal doses of this input from other industries, or to activate unutilised stocks of inputs, so that its unit-cost won’t increase appreciably. The former may, admittedly, not be the case with inputs such as specialised capital equipment, but the empirical observations on spare capital capacity in industry back up Sraffa’s point. This means that the ratio of inputs remains constant as output is increased. The reasons firms have for keeping spare capacity were, I think, sufficiently discussed in the tutorial. An important point to note is that the output of a firm producing at constant marginal cost is constrained by demand. Sure, the firm would like to sell as much as it could possibly produce, but because in the real world firms aren’t perfectly competitive and products are differentiated, for a given demand there’s only so much output that can be sold. We could also add that a firm is constrained by available internal and external financing. Production takes time, and workers typically have to be paid before the output is sold. I hope this makes the whole story a bit clearer, and if any questions remain please feel free to ask them next week! Also, I emphasise again that it’s really worth reading Keen’s book. If not all of it then at least those chapters with direct relevance to the course content. It covers not only the stuff you talk about in your tutorials, but also things you will be examined on (such as the Post Keynesian theory of the firm) and it really helped me get a better idea of the concepts, whilst at the same time it is quite entertaining. Keen, Steve (2011) Debunking Economics – The Naked Emperor Dethroned? Revised and Expanded Edition, London: Zed Books. Lavoie, Marc (2009) Introduction to Post-Keynesian Economics, Basingstoke: Palgrave Macmillan. Mankiw, Gregory (2012) Macroeconomics International Edition, 8th edition, Basingstoke: Worth Publishers/Palgrave Macmillan. Pindyck, Robert and Rubinfeld, Daniel (2012) Microeconomics – International Edition, 8th edition, Boston: Pearson. This entry was tagged firm, Keen, marginal cost, Neoclassical, perfect competition, Post Keynesian, production, Sraffa, tutorial. Bookmark the permalink.